I am a truly lucky man. I have wife and daughter that love me. My family is healthy. We have jobs and are able to pay our mortgage. And I have some of the best fly fishing in the World available “in my back yard”. This last weekend, September 11 & 12, 2010, I was “sent” by my wife on a two day overnight trip to Rocky Mountain National Park. She say’s I needed a mental vacation since work has been crazy busy and family schedules did not leave much personal time lately. The days leading up to the trip were spent planning where to fish, checking weather, tying flies, updating pack lists etc. After living 2 years in Colorado, I wanted to scratch the endangered and native Greenback Cutthroat off my list. From what I was able to research, they are plentiful in RMNP, in particular the Roaring River. Accessible by a moderate/difficult hike via the Lawn Lake trail, you will be rewarded with the stunning beauty of the high country and one of the most beautiful Tenkara creeks there is. Clear, cold water is tumbling down from Crystal Lake at apx. 11,400 ft. down to just below the Alluvial Fan area where the Roaring River joins Fall River in Horseshoe Park at about 8500ft. The Alluvial Fan area was created by the Lawn Lake Flood in 1982, which carved out much of the valley to how it still looks like today - lots of gravel, rocks (big ones! ), dead trees etc. Fishing was easy as long you remembered the length of your Tenkara rod and trees, brush and dead trees surrounding you. On the first cast I had a little splash rise but no hookup. I continued hopping from pool to pool and catching nice little Greenback’s. I changed flies, and the fish did not particularly care about the pattern, I got ‘em all on CDC&Elk, Balloon Caddis, Parachute Ant, Charlie Boy Hopper etc. I stayed all day long with dry flies which is so much fun after having nymphed for the better part of the last 5 years. A little bit later I was hiking further upstream when I saw a guy with a backpack loaded with Tenkara rods – what are the odds this happening? Turned out that the guy, Chris, was up there with Jason Klass of Backpacking Light, to take some pix for Jason’s website BackpackFlyfishing.com. It sure was nice to catch-up with someone who has been practicing Tenkara a bit longer than the 2 months or so that I have been addicted to it. Click here for his blog post about our meeting. After a full day of playing with the Greenbacks, I started hiking (and fishing) back in the afternoon once the sun started to cast it’s shadows over most of the valley. I was amazed at home many more Greenbacks I was able to pick just dabbling an CDC&Elk October Caddis (orange CDC feather). On one of the last pools, I was rewarded with a very soft rise and once I set the hook, I knew this was “the” fish of the day. I landed the most colorful fish of the day, the belly almost purple, big huge spots and pushing 13” – a giant for this little creek. She was fighting and struggling hard and unfortunately I couldn’t calm her down to make a picture. I should have used a net… Anyway, I prefer to not to stress fish too much just for the sake of a picture so I let her go. Maybe we’ll meet up again, I know where she lives! Once back at the trail head, I headed over to the Alluvial Fan area to see if I could entice a few more trout, but all I caught were some wet sneakers and sock. I should have kept my wading boots on. I was heading to Estes Park where I found a last minute accommodation (note: during the Scottish Heritage Festival it’s REALLY hard to find a bed in town). After checking in I went out for a pint of delicious Fat Tire and an Elk Burger which was a disappointment, the cook must have been daydreaming. Not sure I will go back there to eat. The next day, I decided not to get up too early since the mornings are very chilly. Went to my favorite place in Estes Park for breakfast and then headed down on 7 to the Wildbasin entrance to fish the North Fork of the Saint Vrain River. This river is at a much lower elevation (apx. 8500 ft.), but holding a much more diverse trout population (Roaring River features “only” Greenback Cutthroat). Once I got to the trail head, I was sort of disappointed by the cloud cover; in combination with the wind it was really cold. I bundled up with my wind proof fleece, got my backpack on and headed to the river which I was drooling over already by driving up the dirt road to the trail head. 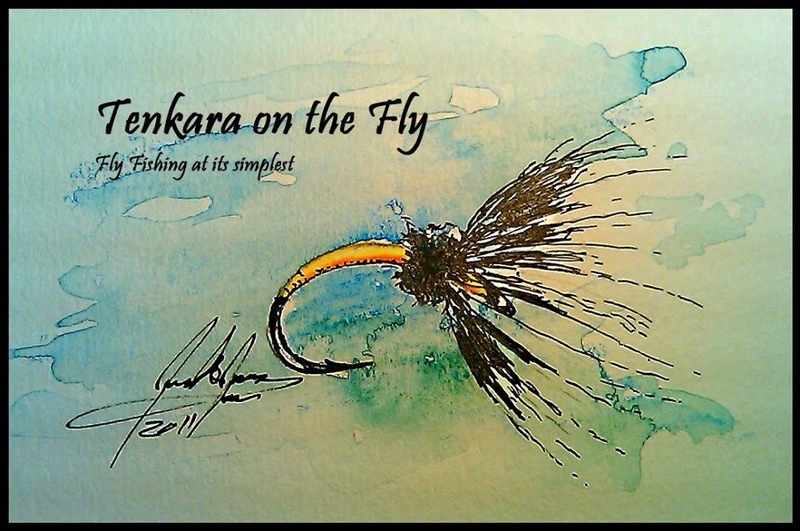 Also here it became obvious that a Tenkara rod is so much more effective that a “Western” fly rod. The additional reach and light line let’s you manipulate your flies in way you can’t with any other technique. When I didn’t get any response on a dead drift, I would follow-up with a few drifts twitching, pulling, skating and dragging the only dry fly I used all day (again, CDC&Elk, tan) with a sakasa kebari purple dropper (which got munched up and was later replaced with an as effective blue sakasa kebari). Very happy and very tired I packed up in the evening and drove back home. This trip was one of my best fishing trips ever, only rivaled by a trip to the Catskills 5 years ago where I landed 3 of my 5 biggest brown trout to date. I am falling more and more with Rocky Mountain National Park and can’t fathom why it took my 2 years of living in Colorado to go up there and fish. This has become one of my favorite places in the world (and believe me, I have seen a good chunk of the world!). Tight Lines & stay tuned for more.